Dagon University Library launched as soon as the university was established in 1993. It was then situated on 1st floor of building No. 31. At that time there were 1630 volumes of books. In 1999, the total collection of the volumes reached to 3554. Electronic Library (ELIB) software has been used to record the library collections since 2000.
eCatalogues are provided at the website. The users can search e-catalogue by author, title, subject, keyword search and advanced search through our library automation system (ELIB Software). At present, the library has over three hundred thousand collections. Most of them are academic books correspond to the teaching programs related to the university. In addition, fiction and non-fiction; theses, project papers and old questions of Dagon University. Annually, enrolled students, office staff and faculty members have registered at the Library. It needs present his/ her identity card, giving 2 passport photos to the library. Outsider users need Government Department or recommendation letter of a professor from Dagon University. * Researchers and outsiders can use in Library. eTekkatho Digital Library was donated by Manchester University in November 2013 and the offline is updated by every six-months. It offers over 1700 full text resources. 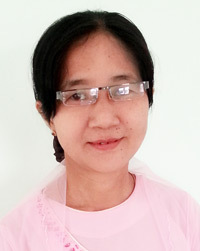 And special collection resources which include Wikipedia in English and Myanmar Languages, Massachusetts Institution of Technology’s Open Courseware and Video file. 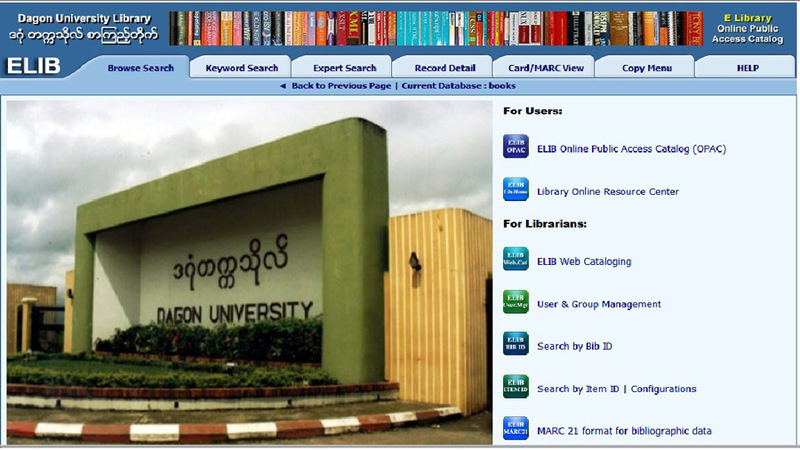 The eLibrary MynamarProject is funded by the Open Society Foundations Higher Education Support Program and implemented by EIFL (Electronic Information for Libraries) and launched at Dagon University Library in December 2014. More than 35 e-resources (including 10,000 + full-text scholarly journals, 130,000 + full-text academic e-books, a vast range of other materials) are available on EDS. ProQuest Databases and resources are donated by iGroup-group of companies and providing ProQuest Central and ProQuest Dissertations & Theses. More than 1.5 million full-text graduate works and 2.7 million A & I records including works of Nobel Laureates. iGroup also offers resources of OECD iLibrary that includes 10,100 eBook Titles, 43,850 Chapters, 104,400 Tables and Graphs, 4,500 Articles, 4,380 Multilingual Summaries, 4,630 Workings Papers and 5 Billion Data Points across 42 Databases. eLibrary Orientation Sessions are provided at eLibrary for students on every Wednesday and Friday in every semesters. Trainings for faculty are also provided occasionally. If you have any question about the library, Please contact to library@dagonuniversity.edu.mm.